Persons receiving a juror summons from the Pend Oreille County Clerk’s Office have been randomly chosen from the pool of prospective jurors. Prospective jurors must immediately complete and return the juror questionnaire. All information received will be treated confidentially. It is important to provide complete information so that the court can either qualify you to serve or excuse you from service. Most jury trials last 3 to 4 days and jurors are free to return home in the evenings. Jurors are usually required to serve on one trial. 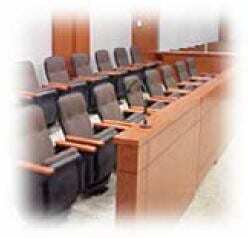 Keep in mind, if you are chosen to sit as a juror the trial may last longer than one week. Jurors are selected at random from lists of voter registrations, drivers licenses, and Washington State identification cards for residents of Pend Oreille County. The lists are combined and duplicate names are eliminated. However, different spellings or name variations may result in duplication. Jurors are paid $20.00 per day and .53 cents a mile. Checks are usually mailed four to six weeks after the jury term ends. Call the Jury Clerk at (509) 447-2435 or email kkeogh@pendoreille.org with any questions.